The snow has all melted and everywhere you look there are signs of life re-emerging. Shoots springing from the ground, flocks of birds in the air. Spring is here, and with it comes fresh fashion and new inspiration in makeup and beauty. I recently attended the Spring Trends show at Nordstrom here in downtown Chicago, and came away with SO much beauty inspiration. Allow me to share the brightest and best spring makeup tips for bellas all shades of beautiful, as inspired by the Nordstrom Spring Trend show. And psst, bellas – you can find the hottest trends at a high end department store, or even right around the corner at your neighborhood drugstore! Trend #1 – All Honeysuckle Everything. Honeysuckle can best be described as an optimistic shade of pink. Not quite romantic rose and a few shades behind fierce fuschia, it’s romantic, bright, and feminine. It’s Pantone’s pick for Color of the Year so you’d be trendy and with it if you include honeysuckle into your beauty regimen. You can add the potent pink to your makeup – consider a honeysuckle colored blush, like Cameo Glow by Burberry. A honeysuckle colored lip is a sure fire attention getter, in the prettiest possible way. I loved the look of Estee Lauder’s Pure Color Gloss Stick – Berry Pink is perfection for a variety of skintones. If you love this trend and can’t get enough, you’ll find all the shades of pink you’ll require in Bobbi Brown’s Pretty Face Palette. $60 for pinks for your eyes, cheeks and lips. If your pockets can’t justify department store makeup prices, I highly recommend Cover Girl’s Queen Collection Lip Color, there’s a range of beautiful pinks and roses that fit the beauty bill. If you’d rather not wear the color honeysuckle, you can always enjoy its beautiful fragrance – at the drugstore there’s Degree Women Natureffects in Honeysuckle & Tea Tree, a scent that’s both invigorating and pretty without being cloying. So you can on trend, but undercover. Trend #2 – Pastel Eyes, Lips, and Nails. Just in time for Spring, and Easter – the pastel trend. It’s girlish, glowing, and gorgeous. 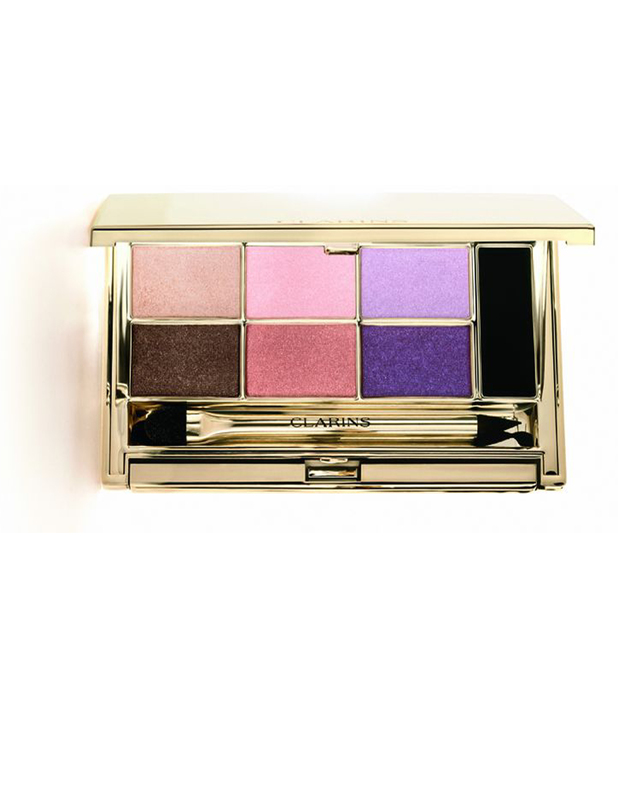 The gurus at Clarins have found inspiration in watercolor paintings, and their NeoPastels color collection is all about soft, wearable, feminine makeup to accentuate features to flattering effect. I was lucky enough to interview Eric Antoniotti, Clarins Artistic Director and International Makeup Trainer and when he tried to talk to me about this makeup collection, just about everything had already sold out! Women were lining up to buy these eyeshadow palettes. I didn’t get a chance to review, but they looked beautiful on the ladies who were getting their makeup done by Clarins artists. Pastels can be sweet and soft – think pinks and lilacs for eyes, cheeks and lips. Or they can be unexpectedly fresh and a little edgy – think soft seafoam green, unexpected lilac or baby blue for eyes, or a tender teal for your nails. You can find sweet and edgy, hot and trendy in the new China Glaze crackle nailpolishes available at Sally Beauty Supply. Crushed Candy over a dark grey? Pretty pastel with an edge. Rawr! Trend #3 – gorgeous glowing skin that’s beautiful from within. This is one of those trends that isn’t really a TREND per se, but a beauty essential. However several brands at the Nordstrom Spring Trends show were REALLY stressing the importance of beautiful skin, and the fact that some makeup is made to protect and beautify from the inside out. Whether that means treating problems that already exist, or preventing issues that come with age depends on your stage in life. Eric Antoniotti, Clarins Artistic Director and International Makeup Trainer pretty much sold me on their Instant Smooth Line Correcting Concentrate – a “magic pen” that Eric described as a “bridge product” that is amazing for filling and treating lines and wrinkles. You can use it under, but he personally uses it on top of foundation. Also – insider tip! – Eric loves to mix Clarins’ Instant Smooth Reflecting Touch with foundation because it “disappears open pores.” Note to self: try this IMMEDIATELY. Over at Chantecaille, potential customers were being educated about the benefits of rosewater, a key ingredient in just about everything Chantecaille makes. 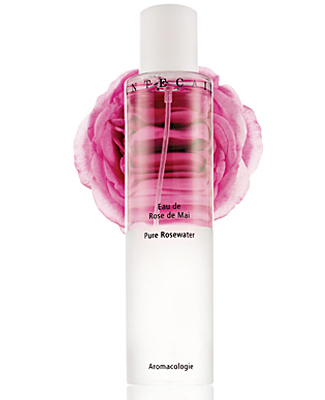 Their Pure Rosewater is distilled from Rose de Mai flowers that are exclusively grown in France, and their makeup experts say it’s “like spraying liquid moisturizer on your skin.” And they strongly recommend using skincare down your neck and to your decollete. Mama Bella taught me well! Orange, coral, even a bold bronze will do. This season, you should consider adding a mango colored lippie to your repertoire. Hello Beautiful recommends shades by Milani and Bobbi Brown, two brands I LOVE. I also recommend MAC’s classic Morange lippie, or Studded by Lancome, which is like a coppery golden orangy POW kind of lipstick. For a barganista version of this look, definitely check out NYX Cosmetics lipsticks in Citrine or Citrus for a warm, bright, Springtime look. Those are the biggest trends on the radar for the first day of Spring! I’ll be back with more as the season heats up. Which trend do you see yourself incorporating into your rotation? « Chicago! Come To the Rock The Red Fashion Show! You have got it right all of these shades will be major this season. These are some great products to keep your look fresh this spring. Thanks for sharing!! Bold lip color and subdued eye? Eek. I guess I’ll have to take the plunge. I’ve always felt my lips were to big for a bold color. I’ll try it and see how I feel (and what reaction I get). Bought some Clarins Instant Smooth Reflecting Touch on EBay to try with my Smashbox tinted moisturizer and Iman foundation. OT: Do you have any other recommendations for the Nars Multiple stick? I bought Lamu, tried it today, and it looks like I got hit with a glitter bomb….